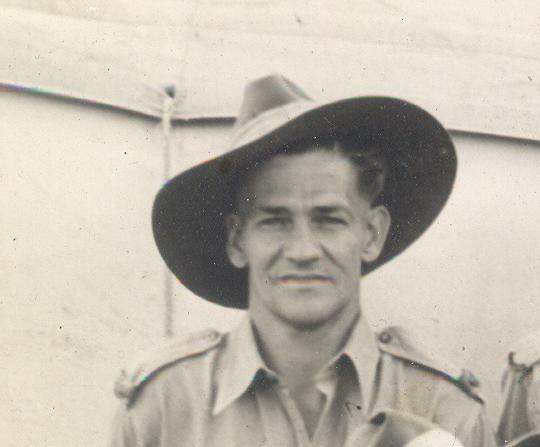 My Grandfather, William George Busby, served in World War 2 and was based in Darwin at the time it was bombed in 1942. The bombing continued from 19 February 1942 to November 1943. Darwin was bombed 64 times during this period. Other areas also bombed were Townsville, Katherine, Wyndham, Derby, Broome and Port Hedland. 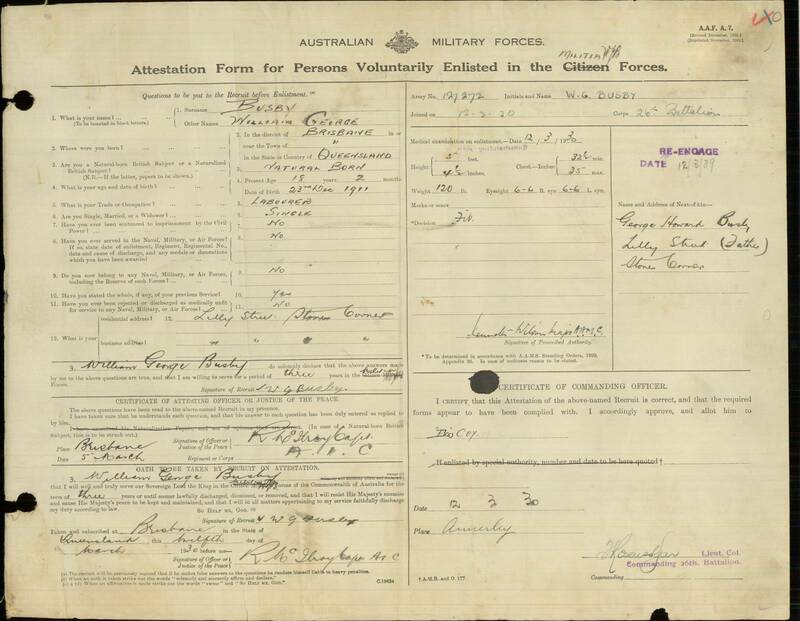 I have his WW2 service records although these are not available online. William also served in New Guinea and Borneo. William wrote regular letters to his wife Myrtle and I am lucky enough to have inherited many of these letters (over 200). 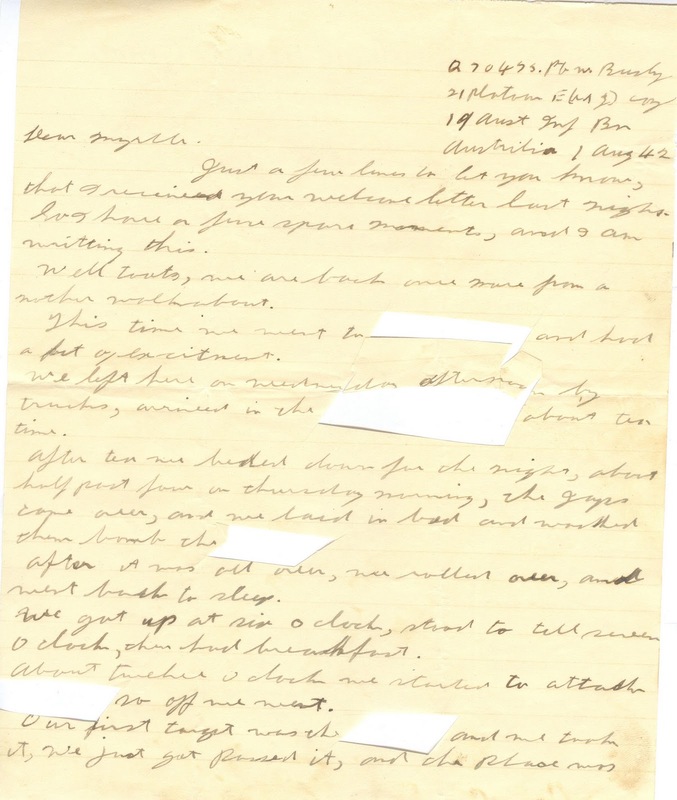 The plan, when I have time, is to transcribe the letters. William’s handwriting was not the most legible and my experience in reading Doctors’ handwriting over many years will be very useful! I suspect this may be an even longer job than I had first thought! Just a few lines to let you know that I received your welcome letter last night. I have a spare moment so I am writing this. Well, Toots, we are back from another walkabout. This time we went to […..] and had a bit of excitement. We left here on Wednesday afternoon by truck arrived in the [….. ] about tea time. After tea, we bunked down for the night about half past four on Thursday morning , the Japs came over and we watched them bomb the […..]. After it was all over we rolled over and went back to sleep. We got up at six o’clock, stand to till seven then had breakfast. About twelve o’clock we started to attack […..] so off we went. Our first target was the […..] we took it, we just got past it and the place was bombed again, nobody was hurt. So the game went on we mounted our guns and stayed where we were. About a quarter past three on Friday morning we left there and off we went to [……], took the town had breakfast and watched for the trucks to come and take us back to camp. Now there is another watch about coming off now, and oh boy is she going to be a long one. I’ll say it fast I may not be able to write next week. The arm goes to sleep, ?? I carry the rifle that side, it is Ok otherwise. I seem to be in the news as everybody is asking after me. So poor old grammie (?) is just about to go, well the poor old soul has had a hard life. I don’t see the old man taking that job as he likes his bed. What unit are they in as I cannot place the names. Well Toot I will have to close now, as I have run out of news.